The Dragonfire Blues Kat HSH Set offers smooth, warm clarity and power as well as enough heat to make your guitar purr for outstanding blues performance. For the Humbucker bridge and neck, the A5 Vintage Buckers offer warmth, strong bass and strong highs. 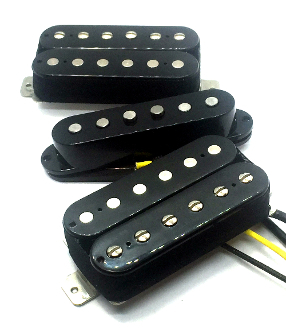 This humbucker style is 4-wire and can be coil-split. For the Single Coil middle, Texas Blues Strat pickups give you the Hot Texas tone needed to amp up your playing. Overwound with unique blue wire for some of the hottest single coil performance out there, these will bring the heat.